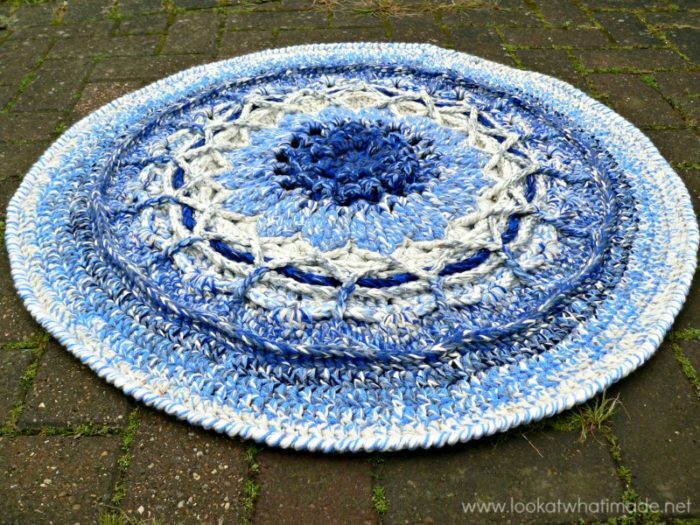 I have made another Mandala Rug…this time using John P Kelly’s gorgeous Mandala in Bloom pattern. 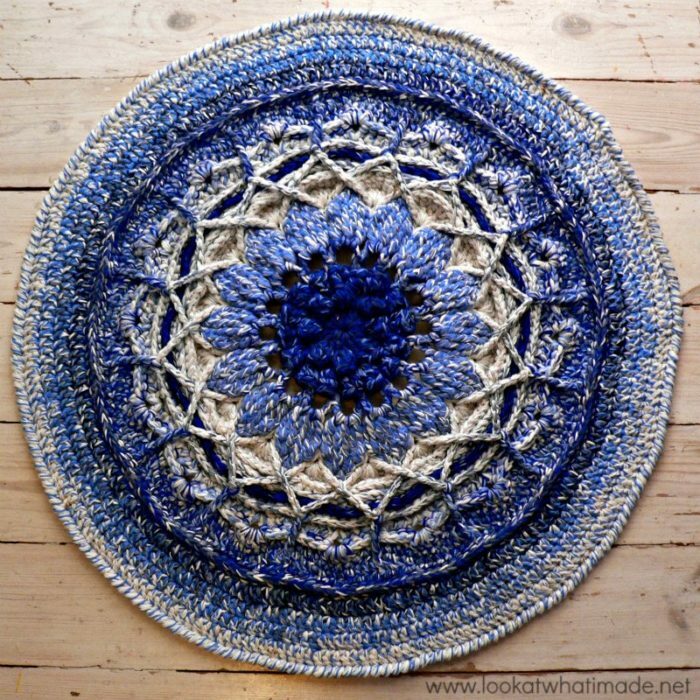 You might remember the Mandala Rug I shared a while ago, which I made using John’s free Mandala 21 pattern. I loved it so much that I practically begged John to let me test Mandala in Bloom for him. Okay…I didn’t have to beg, but I totally would have! So here, for your viewing pleasure, is the rug I made using the Mandala in Bloom pattern. Please note that this rug does NOT do the pattern justice. Head over to John’s blog, He is Hooked, to see some of the gorgeous colour-pathways the other testers used. I used 8 strands of yarn (various types and thicknesses…some of them from frogged garments – more about that in a second) and a 8 mm crochet hook. 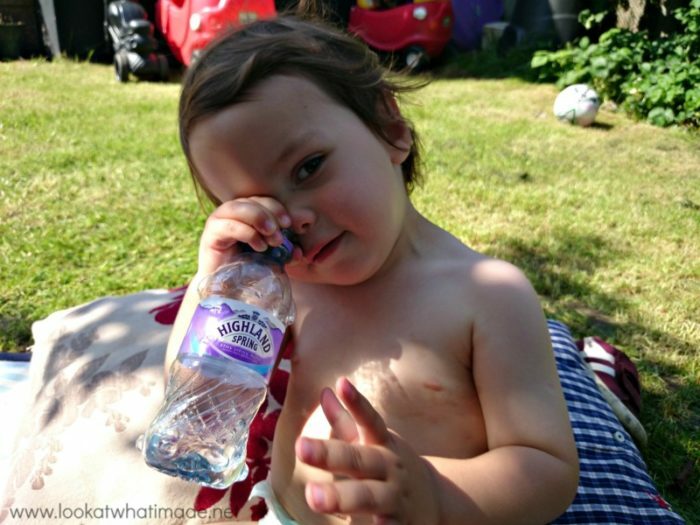 The boys had one or two hand-made (gifted) items that I loved so much, and that held such sentimental value, that I didn’t want to give them away when they became too small. We have no family (with little ones) in England, so we would probably have ended up giving them to a charity shop. The thought of a stranger buying them from there and not treasuring the love that went into them was just too much for me. So I frogged them (I KNOW!) so that I can re-use the yarn. Not because I am frugal, but because I am a sentimental sop and I just love remembering the boys in the cardigans every time I step on this rug. If I say this mandala rug took me 20 hours to make, I am not exaggerating. 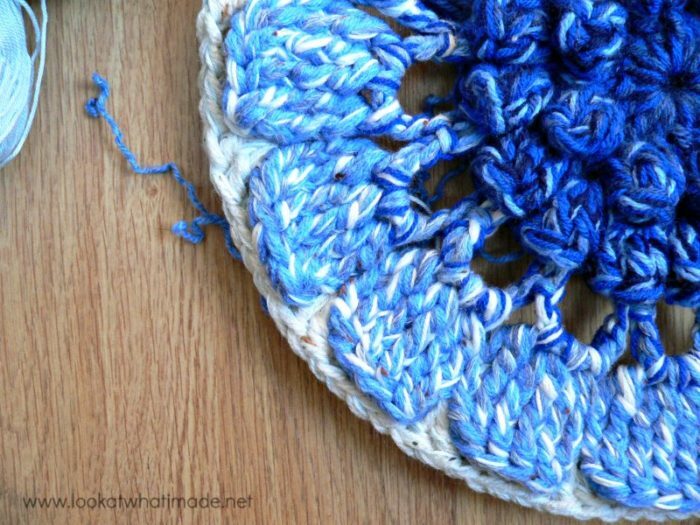 You have to keep in mind, though, that making front-post stitches and back post stitches all over the place with a large hook and 8 strands of yarn will never be as easy as doing it with a 4 mm hook and a single strand of double knit! I think that it was worth every hour, though. Just look at the gorgeous detail in the design. 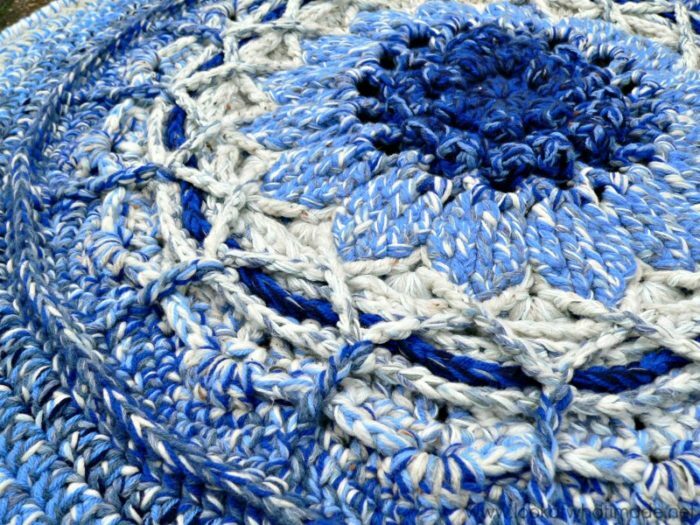 And this rug has got some serious texture! It almost bounces when you walk on it. 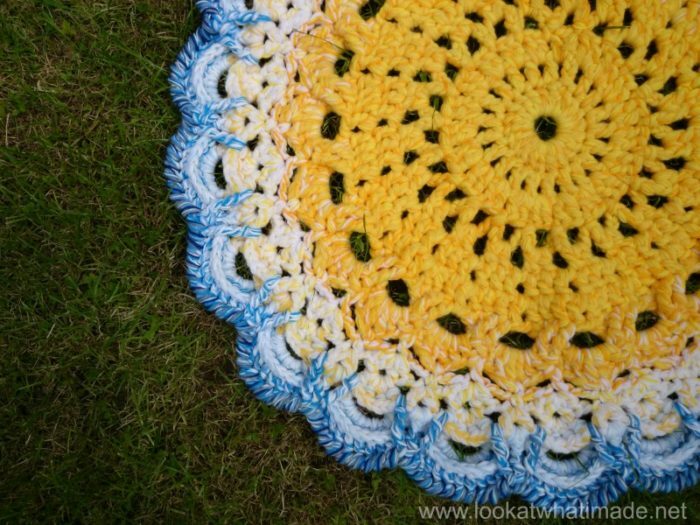 My best memory of making this rug was sitting outside under our pear tree with Christiaan and Xander, crocheting my little heart out while Xander chatted and splashed me with water from his water bottle. Where were numbers 1 and 2? Inside playing PlayStation, of course! Mandala in Bloom has 24 rounds in total. I added 4 more dc rounds to get the edge to lie flat, ending up with 228 st’s in the last round. One final round of crab stitch (reverse single crochet) and VOILA! 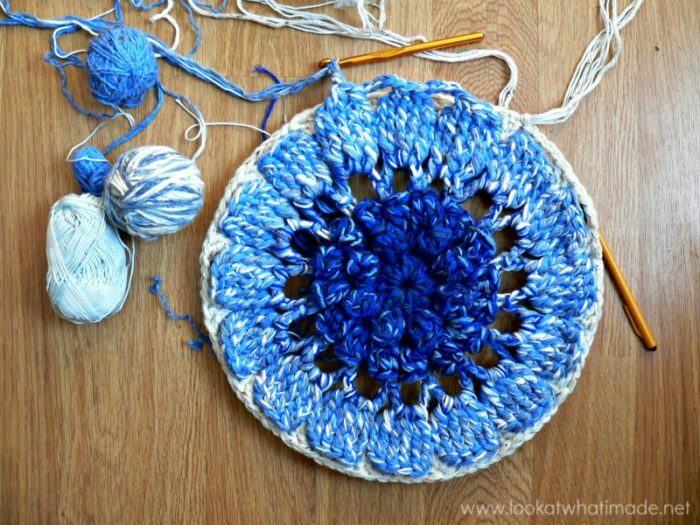 I have one almighty big callus right at the base of my right pinkie finger from making this Mandala Rug. And every time I look at it, it reminds me of my beautiful rug and a good friend made. The rug is gorgeous! Anychance you can post that second pattern for that rug? Would love an opportunity to make it! Have you published the Mandala in Bloom yet? if so, where can I find it to purchase it? It’s gorgeous! When will the pattern be available again please? What a pity that John’s blog has been removed! Love all your work. Indeed. But he has given me permission to share both his patterns and I am slowly making my way around to posting the second one. 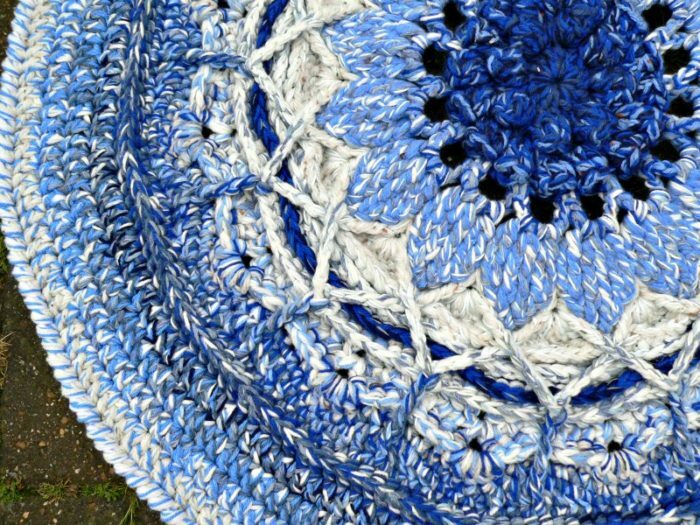 Dedri, John’s website is not longer functioning and he doesn’t have for purchase through ravelry (only through his site). Do you happen to know if he has it listed anywhere else to purchase? Hi Trisha. John has given me permission to publish his patterns on my site. I have just done Mandala 21 as an Instagram make-along, and will post it on my site soon. Mandala in Bloom will follow. That’s so exciting! I can’t wait. I love seeing all of your beautiful work. 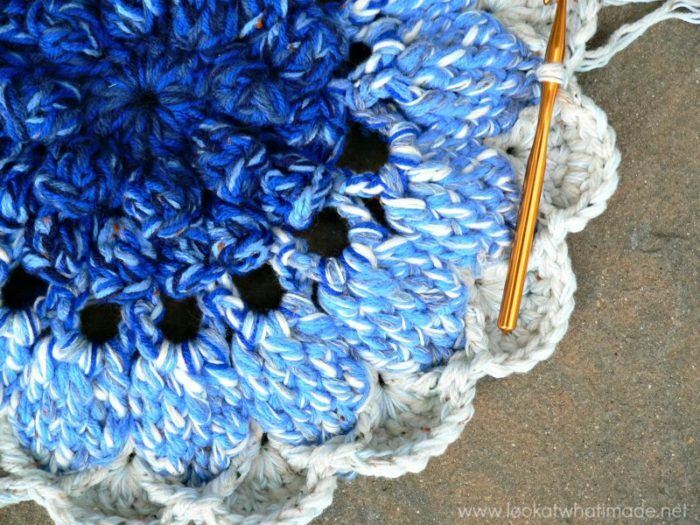 I’ve been wanting get to make a rug in crochet & this pattern is wonderful. Of course I need to see all your other wonderful designs before I decide. But thank you so much for inspiring me to challenge myself. You’re the best! Love your work. Will be looking for patterns, especially the one you posted yesterday. Thank you so very much for sharing your work. Love this rug! Could you tell me the size for it and the original mandala? Hi Rebecca. My rug is about 80 cm in diameter. I am not sure what the size of the original is. Maybe John will be able to answer that for you? Dedri…you are so inspiring and encouraging. I love your rugs and color combos and would love to give these a try. But for now it must wait. So I will just oooohhh and aawwwww over yours! Thanks for sharing your gorgeous work! I love this pattern and would love to purchase it. But I live in the U.S. and the pattern is not sold in U.S. dollars. Please help. Betty, Ravelry takes your currency and turns it into the seller’s currency, so you should have no problems purchasing through Ravelry.